An excellent DVD. I have a problem with the Mary J part, but the Little Wing cession is wonderful. Eric & David give the song a new sound. A magical moment. I hope Eric gives us some others like that for a long time. This was no doubt one of Eric's best concerts , when I bought I couldn't stop watching it for around a week and I still listen to it a lot. I didn't like the Mary J part and Sheryl was alright , Bob was really good and Eric Clapton was just excellent. I've had this DVD for about 6 months now, and I have to say that is it is absolutely brilliant. My only reason for not giving it a full 10 was that I too think that David Sanborn never really got a chance to shine as the other guests did (although he played sax beautifully! ), and I don't think that Mary J Blige's style of music really works with EC's. Apart from that, I thought that the rock songs that EC did with Sheryl Crow worked really well, as did the songs with Bob Dylan. As for EC himself, what can I say? As a budding guitarist, watching the feeling and emotion that EC puts into his music really takes you to where Eric is when he is playing this song. It's as if he is playing it just for you, with all the emotion of when he first played it. The footage is fantastic as well, as it has allowed me to pick up a few brilliant blues licks that just sound fantastic! And finally, it's all for a great cause! Eric as always as impressive here, both vocally and musically. However I take issue with the musical guests. David Sanborn is a brilliant saxophonist who is never really allowed to shine, playing second fiddle as he does to EC himself. Sheryl Crow is talent less and Mary J Blige, as brilliant as she also is, sings flat throughout. Away from that and Eric still shines as he always does! I'm from Barcelona and I'm 15 years old. 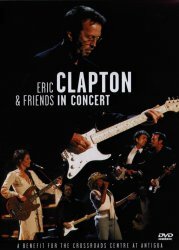 My opinion is that this DVD is impressive for the Clapton's DVD collection. I've got it and I often watch it because it has got very good sound and good songs like Layla, Wonderful Tonight, or Hoochie Coochie Man. You must buy it!! This concert is an absolute must for all Clapton fans out there. I have had it for a year or two now, and I am in pure joy every time I watch it. The band is excellent, and Eric's performance is one of his best. It has a good variety of music to it, not to mention a great unplugged section. The sound quality is also great, it is not one to be missed. Eric's solos are absolutely amazing....he expresses so much emotion. You will not be disappointed!